I make my Colloidal Copper from .999 pure Copper, distilled water that has been restructured using a Tesla Purple plate through the process of electrolysis. This is probably the best way for you to stay young and healthy and live your life full of vitality whilst boosting your collagen supply to promote smooth supple skin.Found effective when used internally, to strengthen blood, clean arteries and veins and boost the body's circulatory system. Ideal for treatment of skin wrinkles and to improve the elasticity of skin; has been found effective against parasites. Through the ages many claims have been made in the use of copper to stop and even reverse the process resulting in hair turning gray. Is this the FOUNTAIN OF YOUTH ? Copper has many properties which make it nearly indispensable to modern civilizations. Copper is an essential nutrient to all high plants and animals. In animals, including humans, it is found primarily in the bloodstream, as a co-factor in various enzymes, and in copper-based pigments. Due to the fact that copper is such a wonderful physical conductor of electricity and heat, it is also considered the conductor of the spiritualist's belief system. According to myths, copper has the ability to conduct spiritual energy back and forth between individuals, crystals, auras, the mind and the spirit world. It is also believed that copper has the power to amplify thoughts when sending and receiving psychic communications. New Age followers carry copper with their stones and crystals to 'straighten' the properties of them, as well they are used when crating crystal wands to be certain of their clear and straight powers. Copper is also quite instrumental in the physical and mental healing rites of many peoples of this world. Medicinally copper has been used for thousands of years. Ancient cultures recognized copper as a healing mineral. Copper was found useful for its healing powers both internally and externally. It is still used in the treatment of wounds and skin diseases, as well as internal diseases, anemia, cancer, rheumatoid arthritis, and heart disease. It is also used for its healing properties in improving circulation of blood, increasing energy and detoxification of the body. Copper is considered a mineral to increase energy and mental agility. In legend, copper is said to be the metal of the God Hermes, who facilitates mental agility, and quick wit. Physically copper is used in traditional Folk remedies to bring additional energies for all types of healing, treatment for arthritis, relieving pain of broken bones, sexual instability and low energy.Copper jewelry is said to ease joint stiffness and arthritis by opening the flow of blocked energy. In this way Copper supports the body’s natural healing process. Ruled by Venus, and corresponds to the letter I and amethyst, is astrological houses are Taurus and Libra. It is sacred to the Goddess and Oya. Use for money and fertility. Venus is the goddess of love, beauty, art, balance, harmony and peace. Venus is the planet with the lowest rotation. The character of the planet and goddess Venus is passive, receptive, magnetic, feminine, relating, adaptation to the other one, kindness and gentleness, enjoyment. From a negative perspective Venus has dominion over includes lechery, coldness and isolation.The metal copper has a great connecting power: it easily combines with other metals and it easily transfers warmth and electricity (think of the copper in electricity wires). Venus Rules Friday and is the planet of love. Copper is the metal of the planet as the copper has the ability to generate a green coating called Verdigrease, or Acetite Of Copper. Venus is also closely associated with the Earth Mother concept. Use copper in rituals, spells and amulets to promote love, sensuality, friendship, positive relationships of any kind, negotiations and peace. Again, healers base their belief in Copper’s power to heal the mind and body based on the metal’s energy conducting properties. They believe that it can even facilitate this process and use it for creating crystal wands and other means of transferring the energy of crystals. They also attribute many of the same healing qualities to crystals and minerals that contain Copper traces. It is sued to alleviate cramp like symptoms, and also said to promote the smooth functioning of the glands, and can help prevent wear, tear and calcification of the joints. According to New Age healers, Copper can stimulate the flow of energy and hence move psychic energies thereby helping the wearer overcome lethargic tendencies, resulting in a more vitalized person with amplified thoughts. They also attribute powers of communication, channeling, cleansing, purification, increasing self-esteem and freeing the wearer of mental burdens. Beginning in the 1970s in the United States, copper used as a healing agent began to increase. People who believe in its power esteem it as a very powerful assistant with arthritic and rheumatic diseases, but also look to it for its healing properties in improving the circulation of blood, increasing energy, detoxification, reducing inflammation, stabilizing metabolism and improving oxygen use. Copper is an essential micro-nutrient. It is needed for red blood cell formation, protein metabolism, the production of RNA, enzyme activity, hair and skin color, and the health of the nerves. If you take large amounts of Vitamin C, you need more copper. Colloidal Copper has been used as a remedy for gray hair, burns, arthritis, parasites and viral and bacterial infections. Colloidal metal supplements are used to treat deficiencies of metals in the body and boost its immune system. The water acts as a vehicle for delivering the metal to the digestive system. Copper supplements have been found to act as an anti-inflammatory as well as treatment for wounds and burns. The University of Maryland Medical Center reports that Colloidal copper promotes healing of skin burns and cuts. The university writes that copper applied directly to the wound promotes faster healing and skin regeneration. Scientists believe that type 2 diabetes is promoted by the oxidation of cells lacking metals which insulate the cells and protect them from free radicals. Two separate studies looked at copper deficiencies and their impact on diabetes. A 2008 Chinese report showed that a copper deficiency or abnormal absorption of copper damages cellular defenses and body tissues, opening the door for the onset of diabetes. Japanese researchers released a report in 2009 showing that copper reduced insulin resistance and glucose intolerance in laboratory mice. Colloidal copper may provide sufficient supplementation to prevent diabetes onset. This is made from 10ppm Colloidal Copper as a base. Then I preformed the John Hudson method by adding Organic Dolomite and swinging the PH. 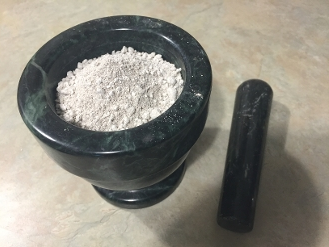 Then after washing it 7 times and drying it out, it is now a fine white Ormus powder that is extrememly high in Copper.